15146.21 Anson E. 7 BIGELOW, son of Irad 6 (Nathan 5, John 4, John 3, Samuel 2, John 1), and Sarah W. (DAY) BIGELOW, was born 25 February 1805 AuSable Forks, NY. About 1827, he married Harriet Bromley who was born 16 January 1808 and died 21 January 1877 (see below). Harriet was the daughter of Reuben and Esther (Hicks) Bromley. (see below) Anson was a farmer and in 1850 this family lived at Black Brook, Clinton co, NY. Anson died 26 April 1891. They are both buried in Fairview Cemetery, Black Brook, Clinton co, NY. (stone above) "Anson was listed as a trustee Aug 7, 1844 of the First Methodist Episcopal Church of Ausable Forks (also known as United Methodist Church)." 15146.212 Eunice A., b 10 Aug 1830 Essex (or Clinton), NY; d 13 Nov 1922; m 28 May 1856 Rev.Charles C. Hart. 15146.214 Ester (sic) Lovina, b 20 June 1836; d 14 April 1911; m 05 Nov 1860 Emerson Featherston. (see stone below) E.W. 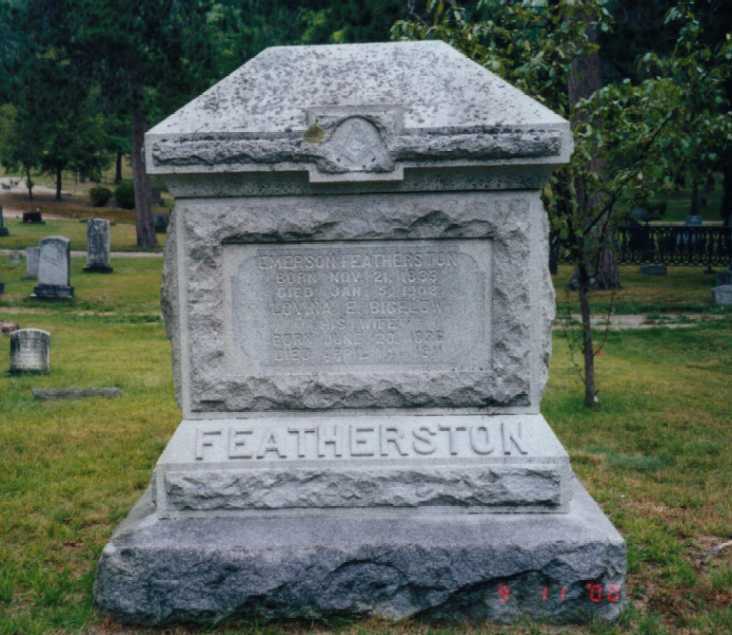 Featherston, (son) was president of Bank of Ausable Forks; 1929-1935. 15146.216 Sarah A., b 20 Nov 1847; d 08 April 1893; m 0l Jan 1869 Warren Dockum. 15146.217t Anson Eugene, b 20 May 1849; d 07 May 1927; m 10 May 1876 Jennie Eliza Buttrick, b 20 Oct 1854; d 12 Oct 1931.
vital records of Clinton and Essex counties, NY. Forks, N.Y., Jan 21, 1877, aged years and 5 days. she made on their minds by her consistent life and godly admonitions. EDITED BY: H. P. SMITH PUBLISHED BY D. MASON & CO. PUBLISHERS, SYRACUSE, NY 1885. At that time Black Brook was part of Peru Twp. page 246: 22 May 1840 under Highways those who resided in district #1 commencing on the west line of the town of Ausable.... together with number of days they had to work on the roads: Anson Bigelow overseer 16 days. page 209: Under Town of Ausable: village of New Sweden included Anson Bigelow. pub 1977 Denton Publications, Elizabethtown, NY. Hi, just for a kick I typed in Anson Bigelow on the computer--what a surprise to find the listing. tried to trace back deeds at the county clerks, but found we got lost in the scribe of the day. and what year. I was wondering if you had any information--the place originally had 167 acres. "Edwin R. Follett, was co-editor with Wendall Lansing of the "Northern Standard" newspaper, published in Keeseville, NY from 1854 through 1860. " Greg's research over several years has dealt with anti-slavery and "Free-Soil" activity in the North Country. The "Northern Standard" was a major free-soil publication, of which very few copies have survived. 605. HARRIET BROMLEY (REUBEN , CHARLES , WILLIAM , WILLIAM , WILLIAM , LUKE ) was born on 16 Jan 1808 in AUSABLE FORKS,NY. She died on 21 Jan 1877. HARRIET married ANSON BIGELOW. ANSON was born on 25 Feb 1805. He died on 26 Apr 1891. + 1359 F i ANNA ELIZA BIGELOW was born on 18 Jan 1828. 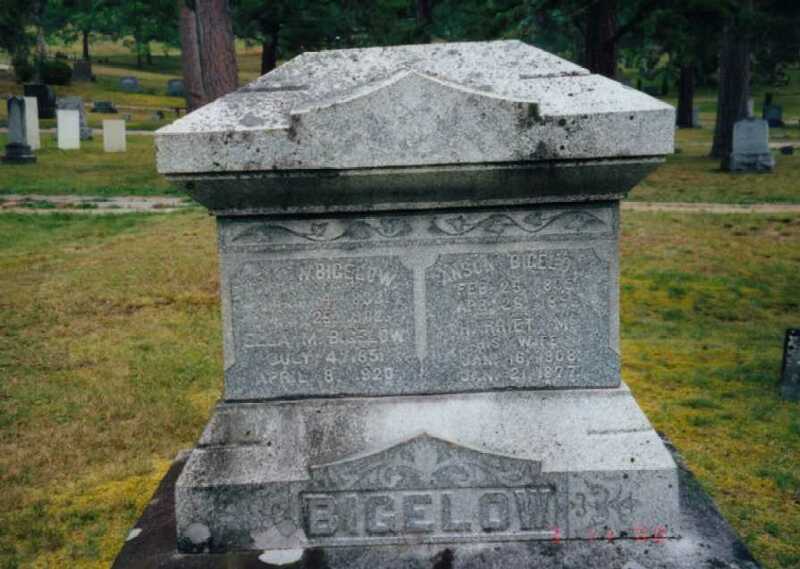 + 1360 F ii EUNICE A. BIGELOW was born in Aug 1830. 1361 M iii IRAD W. BIGELOW was born on 14 May 1833 in AUSABLE FORKS,NY. He died on 25 May 1902. + 1362 F iv ESTHER LOVINA BIGELOW was born on 30 Jun 1836. She died on 14 Apr 1911. 1363 F v HARRIET M. BIGELOW was born on 6 Nov 1844 in AUSABLE FORKS,NY. 1364 F vi SARAH A. BIGELOW was born on 20 Nov 1847 in AUSABLE FORKS,NY. She died on 8 Apr 1893. SARAH married WARREN DOCKMER on 1 Jan 1869. + 1365 M vii ANSON E. BIGELOW was born on 20 May 1849. 1366 F viii ELLA M. BIGELOW was born on 4 Jul 1851 in AUSABLE FORKS,NY. 247. REUBEN BROMLEY (CHARLES , WILLIAM , WILLIAM , WILLIAM , LUKE ) was born in 1783 in DANBY,VT. He died on 06 Aug 1847. REUBEN married ESTHER HICKS about 1803. ESTHER was born in 1783. 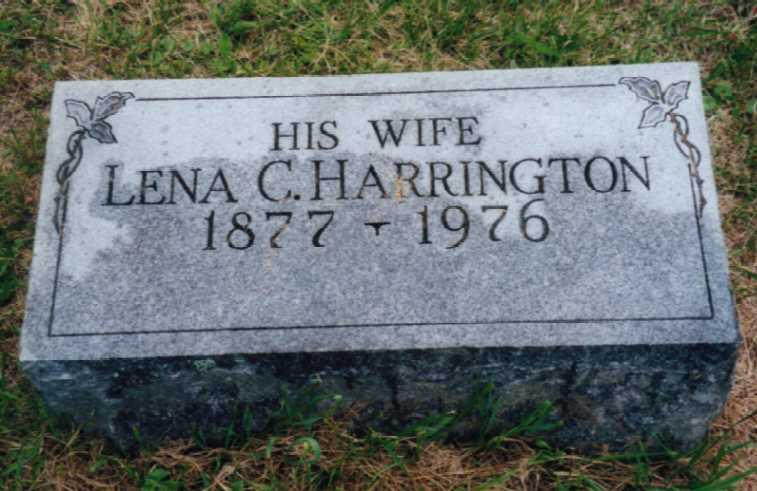 She died on 16 Aug 1847 in CLINTONVILLE,NY. + 602 M i CHARLES BROMLEY was born on 27 Sep 1803. He died on 20 Sep 1883. 603 M ii REUBEN BROMLEY was born in 1805 in GREENVILLE,WASHINGTON CO,NY. 604 M iii ALEXANDER BROMLEY was born in 1807 in GREENVILLE,WASHINGTON CO,NY. He died in 1833. + 605 F iv HARRIET BROMLEY was born on 16 Jan 1808. She died on 21 Jan 1877. 606 F v LYDIA BROMLEY was born on 1 Mar 1810 in AUSABLE FORKS,NY. 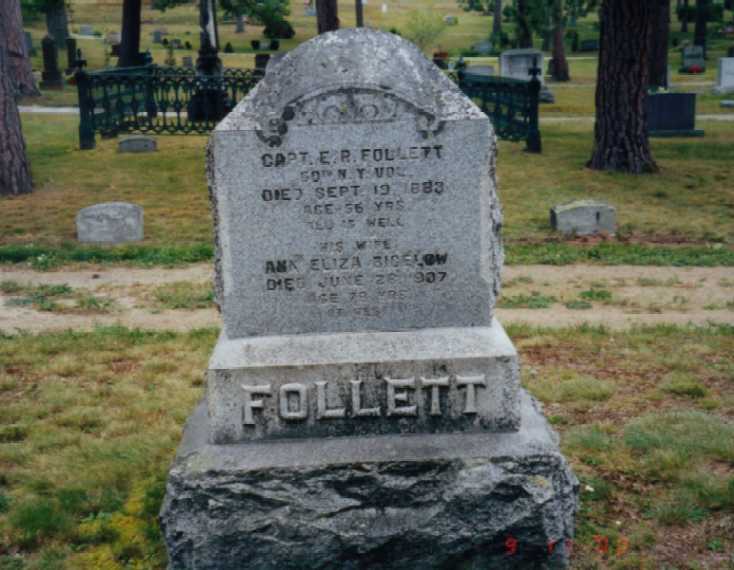 She died in 1893 in OAKLAND,CA. + 607 F vi LOVINA BROMLEY was born on 1 Mar 1810. She died on 19 Feb 1864. + 608 M vii ICABOD BROMLEY was born on 11 Jan 1813. He died on 25 Dec 1876. 609 M viii JOHN BROMLEY was born in 1815 in GREENVILLE,WASHINGTON CO,NY. 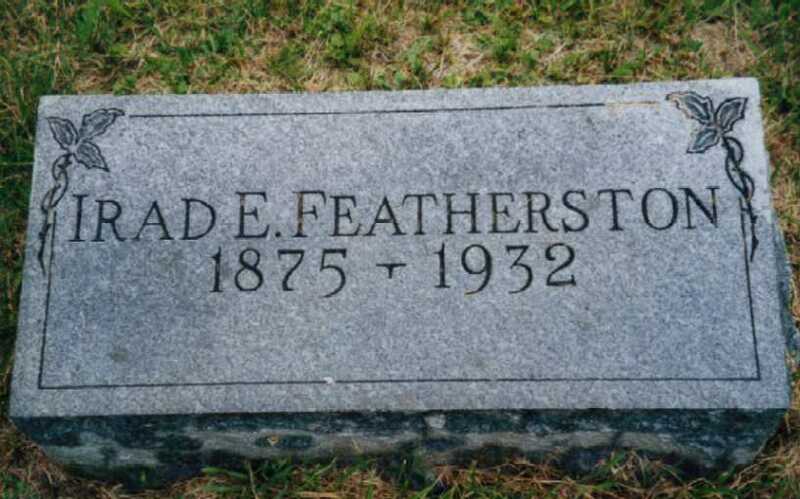 He died in 1871 in ARLINGTON HEIGHTS,CHICAGO,ILL. 610 F ix ESTHER ANN BROMLEY was born in 1817 in AUSABLE FORKS,NY. She died on 16 Apr 1841. + 611 F x ELIZABETH JANE BROMLEY was born on 24 Sep 1827.